Getting your passport photo right when sending off your passport application is a vital part of the process, as if your photo does not fit within the government guidelines it may be rejected which will delay your passport renewal application. We have prepared this quick step guide tutorial to ensure that you get it right the first time. 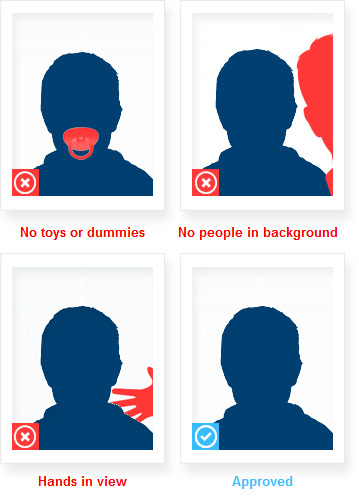 If you have opted to get your passport photo taken at a photo booth you will only need to follow the steps below under the further guidelines section. However if you are an amateur or professional photographer you may want to take your photos yourself. This is fine but they MUST be of a very high quality printed on high quality glossy photo paper. If you do not have the facilities to do this we would recommend using a photo booth. Against a plain cream or plain light grey background, please do not increase the brightness of a photo to make the background appear perfect white as it may be rejected. To be printed on plain white photographic paper, no other colour or watermarked paper will be accepted. They must be taken with a relatively good camera, as they must be clear and in sharp focus, with an obvious difference between your face and the background, we would recommend adjusting the focus so that your face is the most clear and sharp item in the photo. We would no recommend using a mobile phone camera for this task. It is also possible to specifiy a larger canvas extended the border, you can add up to 5mm per side to make a 55x45mm image. Your head must be positioned in such a way that you are no too close or too far away from the camera or frame of the photograph sizes above. Please see example below of how your head should be positioned. If you need to adjust your photo be very careful that you do not adjust the image itself, slight improvements to brightness and lighting will be permitted but if the passport office notices any adjustments to the image it may be rejected. Your photo must be taken within the last month relative to your passport application date. You must only show a neutral expression with your mouth closed (no grinning, frowning or raised eyebrows). Your full head must be showing in the image, without any head covering, unless you have a covering for religious reasons or medical reasons. No sunglasses or tinted glasses, are permitted. Normal glasses are permitted but they must be free from reflection or glare and the frames of the glasses must not cover your eyes. To save delays or problems we recommend where possible to remove your glasses completely. The requirements for children are less strict than those for adults, as hm passport office understand that children can sometimes be unable to follow the guidelines entirely. This means that children who are aged five & under do not need to have a neutral expression and do not need to look directly at the camera. Infants and babies under one also don't need to have their eyes open. If the baby's head needs to be supported, the supporting hand must not be seen. Babies and infants should not have toys or dummies, and there should not be any other person visible in the photo. If your child is an infant we would recommend laying them on a clean light coloured sheet looking up towards the camera. All other photograph standards must be met for children. Thank you for reading this passport photo tutorial, if you have any further questions regarding passport applications or photo requirements please refer to our latest blog posts.